Five years ago, my daughter Brooke, and my son-in-law Cody, gave me a sketchbook for my birthday with a request for images, maps and sketches to help them visualize scenes in the book. The drawing of Lupa on the back book cover is an early draft from my sketch book. Whenever I experienced writer's block, I would either re-read completed chapters or work on book art in various mediums. 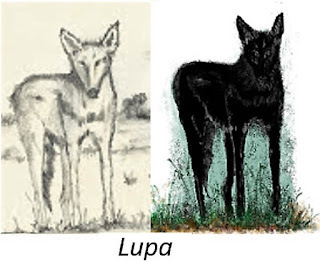 Here is the original sketch and a computer rendering of Lupa.